I think asparagus is one of those things you either love or hate. I am in the hate category but my husband loves it. He will eat an entire asparagus recipe by himself, I’m pretty sure it’s his favorite vegetable. There are certainly worse things you can indulge in, right? Asparagus has a number of health benefits. It can help fight cancer. It is loaded with antioxidants. It supports your brain function and keeps your body from retaining fluids. This recipe was provided by a a guest chef. The article is written by me, but the asparagus recipe was created by a contributor. Asparagus can also make your pee smell funny. It’s kind of a weird thing. I guess it’s hereditary whether or not you can actually smell the funny odor. I did a 23andMe genetic test and it says that I likely can smell the funny odor. Weird, and rather useless information, but interesting anyway. Although I’ll never know since I don’t actually like asparagus. The video below explains this phenomenon a little better. Asparagus is a great healthy side dish, if you actually like asparagus. It can be sauteed on the stove top or you can roast the asparagus in the oven on a baking sheet. 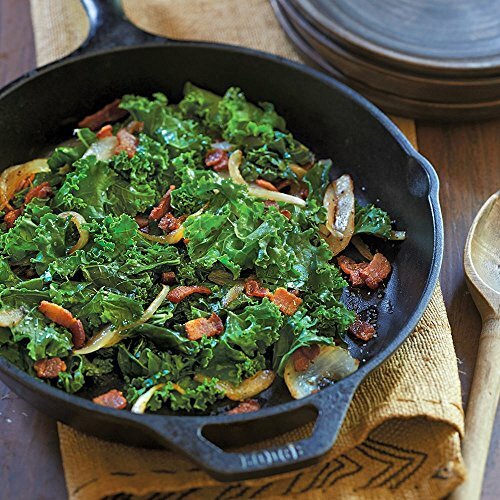 This recipe uses a skillet on the stovetop. Cast iron is the best skillet for sauteeing anything. They heat more evenly than other pans, they last forever and somehow food tastes better when cooked in one. The key to perfect asparagus is to boil it just long enough, and then blanch it in ice water so it doesn’t continue to cook. This keeps it from getting too mushy. When you saute it, it then adds flavor and a beautiful color to the outside of the spears. After your blanch to asparagus, you remove them from the ice water and put them in the pan to saute. Add the fresh squeezed lemon juice. They look amazing and I don’t even like asparagus. This low carb asparagus almondine is a sauteed asparagus recipe with lemon and almonds that goes perfect with your favorite keto dinner. Wash the asparagus spears, and break off the woody sections at the bottoms / ends. Bring a pot of water (big enough to hold and cover the asparagus) to a boil over high heat on the stove. Prepare a bowl of ice water big enough for the asparagus and set aside. Place the asparagus into the boiling water, and cook for 2-3 minutes until they are still crisp but slightly tender. Immediately place the asparagus into the bowl of ice water to stop the cooking. Place the asparagus into the butter, and saute for 1-2 minutes. Squeeze in the juice from the lemon evenly over the asparagus. Sprinkle the almonds evenly into the skillet, and cook for an additional minute. Place the asparagus on a serving plate, and top with the melted butter and toasted almonds from the pan. Nutrition information is provided for reference only. Please do your own calculations to ensure accurate information. Are you on Pinterest? Pin one of the image below!